Plate ‘n’ Sheet Professional Software unfolds a wide range of the steel plate and sheetmetal shapes commonly used in the sheetmetal, piping and steel fabrication industries. It is both fast and easy to use. Ease of use and the comprehensive range of shapes and patterns offers flexibility and simplicity which saves the user time and money. It also reduces the possibility of mistakes and the subsequent loss of time, materials and money. 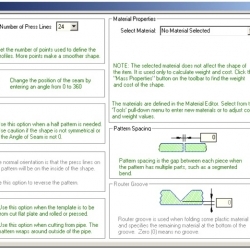 Plate ‘n’ Sheet Development is a software program designed to unfold shapes commonly encountered by fabricators and sheet metal workers. The dimensions and other parameters that define the shape are entered by the user and may be any reasonable value. These may be altered at any time and the appearance shape will change dynamically. The shape may be viewed as either a 3D model or as a flat pattern at any stage of the process. Tools are supplied to zoom in or out to see the shape in detail. 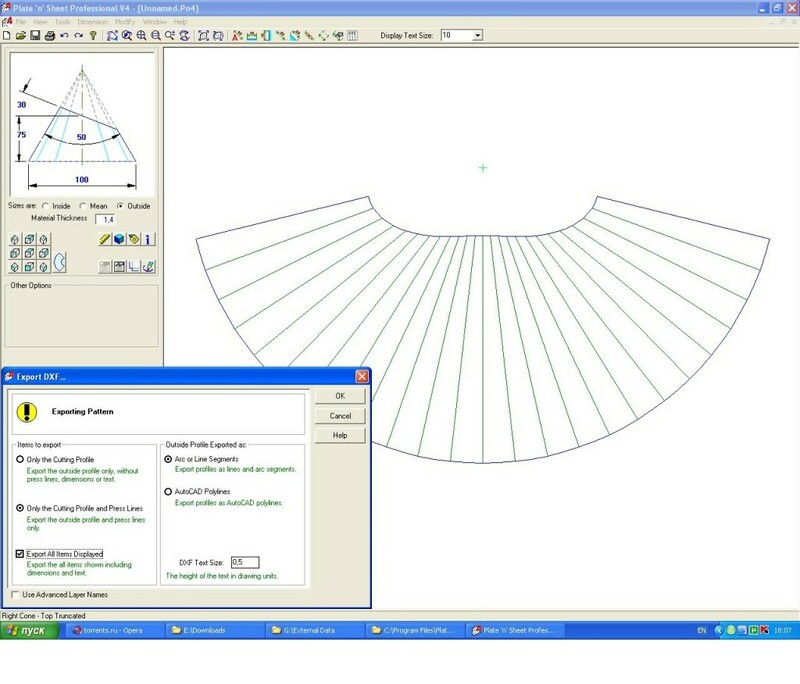 If it is being viewed as a model, several viewing angles (top, front, side, end and four isometric angles) are available at the click of a button and true length measurements may be taken from the model. Where possible, error messages will let you know if a parameter is not valid for the shape being created. 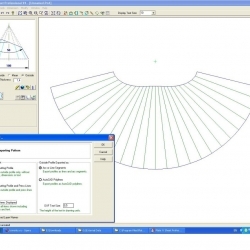 Several dimensioning modes are available and the resultant pattern may be printed or exported as a DXF for use in other software. Start the program and click the “New” button and select a category by clicking on one of the shape images. Enter the values that define the shape. 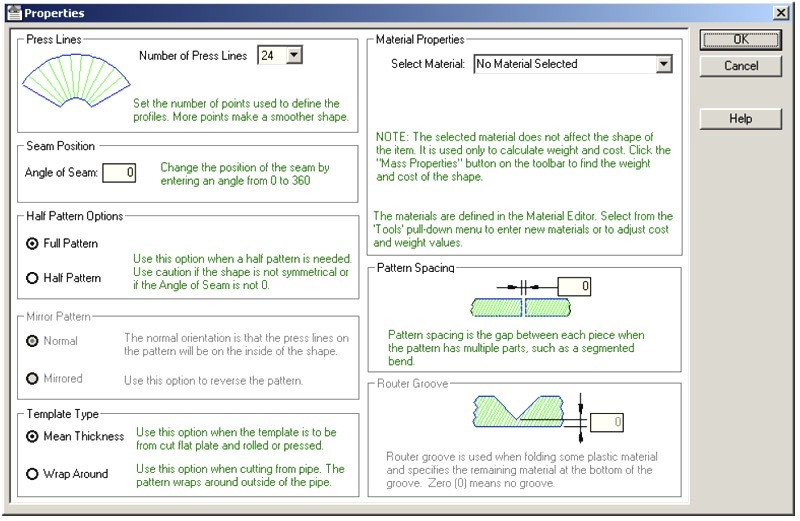 Developments can be produced quickly and easily by entering values such as diameter, height and angles into a user-friendly dialogue box. There is no need to construct a 3D model. Quick results can be obtained by users with very little CAD experience. Use when you wish to magnify a part of the model or pattern to get a closer look at it. Pick the diagonal corners of a box or window around the area you wish to examine. Note: After picking the first corner with the left mouse button, hold the button down and release it when the window is the correct size. The area inside the window is enlarged to fill the screen. A message is disolayed when the limits of magnification are at the maximum.